The annual event in the Ashley Centre was once again organised by long term volunteer Heather Griffin and was a great success. 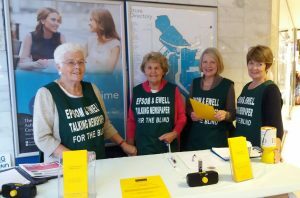 Epsom and Ewell talking newspaper volunteers kindly gave up their time to come along and spread the good news about our free service to dozens of shoppers. As always, people generously made donations to our charity, some as young as six years old, with mum’s permission of course. Shoppers and passers-by were very interested to hear about what we do and the fact that we’ve been doing it for more than 42 years. We have taken details from several people who would be interested in learning more about volunteering with us and also met some visually impaired people who would like to be on our register and will soon be receiving our weekly programme on a memory stick. It was lovely seeing some of our regular listeners, too, and all in all it was a very happy day. We say a big thank you to our team volunteers who were on hand to help out, including our newest News Editor Alan who will be doing his first News recording next week on November 3rd, so listen out for him and he will soon become a friendly and familiar voice. This entry was posted in Talking News by Jan Collier. Bookmark the permalink.